I don't often do underwater scenes, but I've always found Marshian's "UltruMarina" set to be a big help. 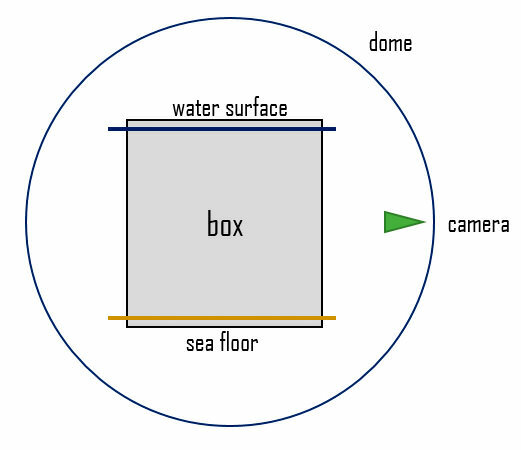 It features a dome, a water surface with an ambient value to simulate light coming in through the water surface, and a sea floor. Simple, but effective. Together with the DepthCue setting on the Atmosphere this works well. In FireFly. But of course SuperFly doesn't support DepthCue. I've tried to find a solution to this, but met with little success. An Atmosphere-wide Volume seems to slow everything down to a crawl. Cycles tutorials for Blender often use Render Layers, which SuperFly doesn't seem to support either. I've seen people talk of using ScatterVolume boxes, but often that's about as elaborate as I've seen the explanations. Some argue those need to intersect with one or more planes, or need to surround the camera - but I've tried playing around with various combinations, and I'm not getting the idea that I'm closing in on a solution. I'm hoping some suggestions can be offered. Here's a bunch of quick renders, starting with no box at the top, and then below two variations with the box. Unfortunately I don't recall which render belongs to which setup. The colour shift is another issue, but I suppose reading more about the ScatterVolume node will allow me to correct that in due time. For now, I'm really curious how others are handling underwater scenes in SuperFly. I'm going to somewhat shamelessly bump this to get it out from under all the spam posted earlier today. My setup is not among those you showed. I don't have a surface plane - the top face of my water box is my surface. 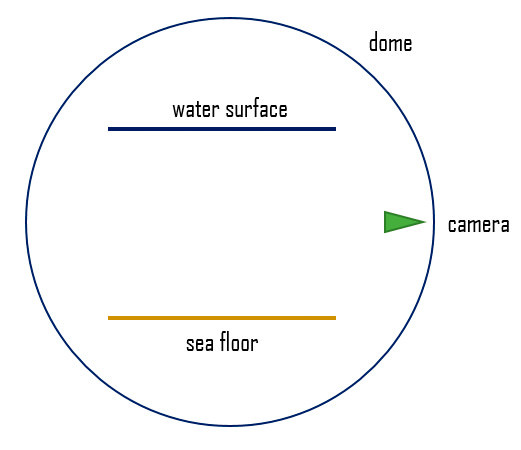 Yes this means the sides and bottom render also as water surfaces if they're visible, but they are not visible. 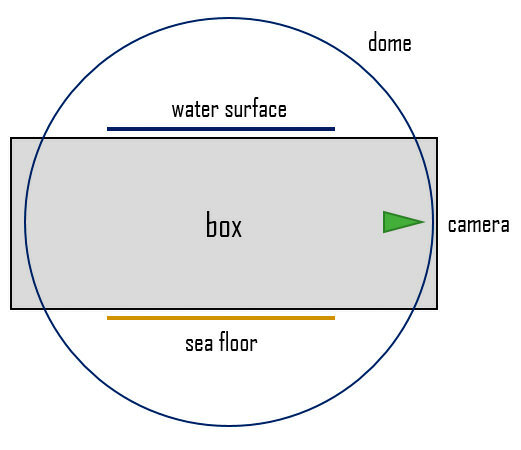 I have the EnvSphere INSIDE the water box sides, and the ground plane INSIDE the water box bottom. 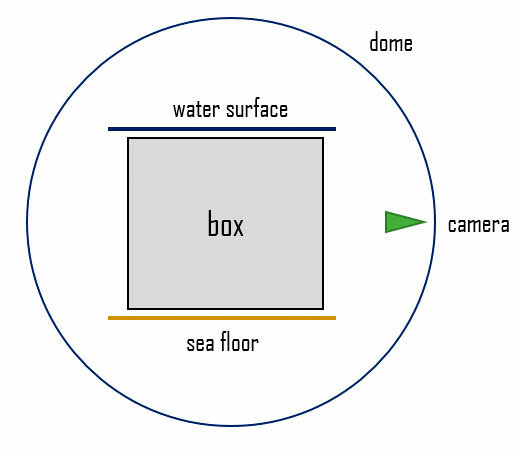 Obviously the water box top is INSIDE the EnvSphere so that the sky is above it. So the camera never sees the sides or bottom of the water box. 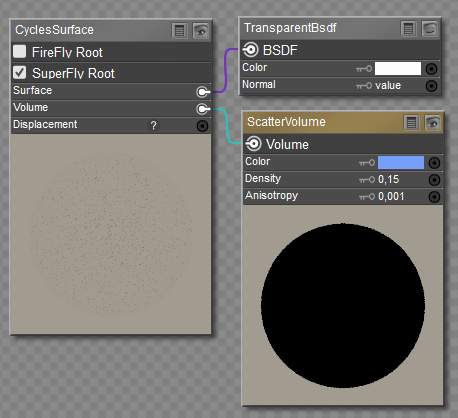 As for the volume effect, scatter is minimal unless you're in dirty water. The primary volume effect should be absorption. Water absorbs (literally shuts off) light based on distance traveled, absorbing red more than blue. Thus, a general blue tinge applies to everything, and increases with the distance from the camera. I've also adjusted the material on the box as follows. Even at Absorption Density settings of 1.00, I'm not getting a lot of drop-off from the camera looking into the distance horizontally (which is perhaps logical, as the light comes from the top), so I'm using the Scatter Density setting to try to obscure the part where the floor reaches the dome. This seems to work, but I'm of course open to suggestions on how to do it better. Maybe the Anisotropy setting can help? I'm still using the dome that comes with the aforementioned set. It has a basic texture that goes from a lighter to a darker blue, which works well enough as a backdrop. It originally also has an Ambient value, but it doesn't seem to be necessary to get enough light in with either a huge Area Light above the box, or an Infinite Light coming in from the top. Speaking of which, I imagine you have a dome texture that includes the sky? That shouldn't be too difficult to piece together. So long as its a JPG, that is. The top of the box looks a bit dull at the moment, which is no surprise as the material has just the Transparency and no Displacement set up. But for underwater only scenes, I think I'm getting closer to what I had in mind. So thanks again, and any further suggestions or tips are of course welcome!